Bullet Club has undeniably become the most influential pro wrestling faction in decades. For over a year, the pop culture juggernaut found stability and conquered with Kenny Omega’s leadership in Japan and with Cody captaining the ship in North America. But recently, rising tension spilled over into an outright assault! With that, Ring of Honor presents the first official match for Supercard of Honor that will have international implications with the fate of Bullet Club hanging in the balance! At Night 2 of New Japan Pro-Wrestling’s New Beginning in Sapporo, “The Cleaner” Kenny Omega was given all he had by “Switchblade” Jay White. After a back and forth battle, White emerged victorious and captured the IWGP United States Championship from Omega. It was, however, what happened after this bout that has the wrestling world buzzing! Adam Page emerged to challenge White for his newly won championship, before Omega stepped between them to praise White’s effort and win. 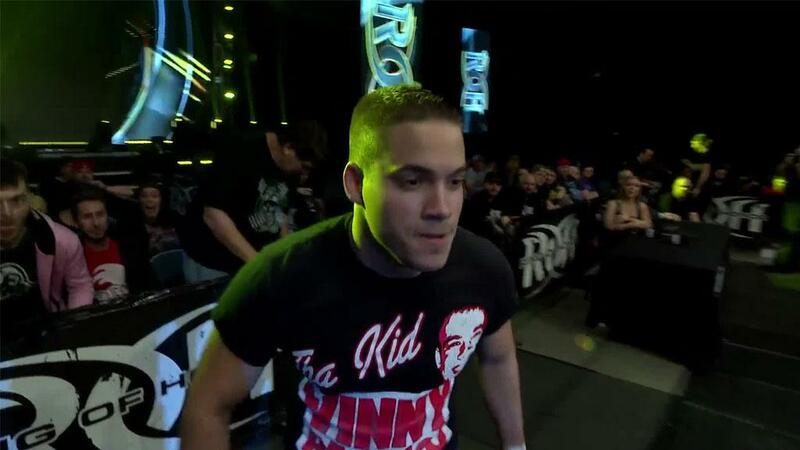 Nick Jackson, Marty Scurll, and Cody soon made their way ringside. Matt Jackson made his way ringside as tension built within Bullet Club. Matt Jackson, still clutching his back that he has been struggling with since Wrestle Kingdom, was pushed to the ground by Omega. Things seemed to settle, with it appearing Cody had become the peacemaker. But as Cody held the ropes open for Omega to exit the ring as tension diffused, “The American Nightmare” acted fast and nailed a Cross Rhodes on Omega! Cody and Omega have appeared to be on the same page when Cody joined Bullet Club in December 2016 but differences have recently begun to show on the popular web series Being The Elite. Fans have speculated that there has been jealousy between the leader of Bullet Club Omega and the man who has been christened as the leader of the American chapter of Bullet Club Cody. Things have gotten so tense between the two that at Wrestle Kingdom, Cody took on Omega’s former Golden Lovers partner Kota Ibushi, with Ibushi winning. When Cody tried to extract revenge the next night at New Year Dash, Omega stopped Cody’s vicious attack as Cody tried to attack Ibushi with a chair! New Year Dash and New Beginning were manifestations of the symptoms that have been showing for months. And at Supercard of Honor XII, ROHWrestling.com can confirm that the two will meet ONE ON ONE for the FIRST TIME! Bad blood has been boiling for months between these two and they will try to settle their differences in New Orleans! Who will emerge victorious? And more importantly, how will this schism affect Bullet Club? Join us in The Big Easy to find out! Supercard of Honor XII will emanate from the UNO Lakefront Arena in New Orleans, LA on Saturday April 7! Like last year’s history-making event, this event will feature high profile stars and very special matches for all of our fans around the world. At the time of announcement, we can confirm that stars from New Japan will take part in this event, and there will be the return of Festival of Honor, featuring all-day autograph signings, Q&A sessions with ROH stars, the Women of Honor Championship Tournament semi-final matches, and more! Last year’s Supercard was the most attended event in ROH history, when thousands of fans from around the globe descended on Lakeland, Florida. This April, The Best Wrestling on the Planet will shatter that record in the Big Easy! Based on the high demand for recent major events, you will want to act fast to ensure you get the best seats and not get locked out of the action!